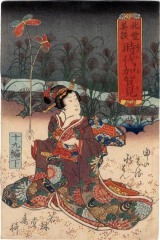 An elegantly attired courtesan is seated outdoors and holds a stick with painted paper butterflies. The publisher is Wakasaya Yoichi (Marks 573). The original story was written by Tamenaga Shunsui (為永春水: 1790-1843 or 44) and published between 1855-83. There is a bit of somewhat contradictory information about the authorship of these volumes on page 222 in James King's Japanese Woodblock Prints: Artists, Publishers and Masterworks 1680-1900: "Wakasaya was also engaged in publishing illustrated books. In 1855, he started to produce the first volumes of the serial novel. “Northern Snows, a Gorgeous Tale and Mirror of Our Times” (Hokusetsu bidan jidai kagami), his most successful publication. Written by Tamenaga Shunshō (1822–1886), it was first illustrated by Kunisada, then by then by Kunisada II and Ginkō, the last volume appeared in 1882." Andrew Lawrence Markus wrote in footnote #104 in The Willow in Autumn: Ryūtei Tanehiko, 1783-1842 that "Among the lavish late Edo and early Meiji serial gōkan bestsellers partially inspired by the success of Inaka Genji figure Jiraiya gōketsu monogatari (Tale of Jiraiya the hero, 1839-1868? ), Shiranui monogatari (The tale of Shiranui, 1849-1883? ), [Hokusetsu bidan] Jidai kagami (Uplifting tale of northern snows: Mirror of the ages; 1855-1883)..."